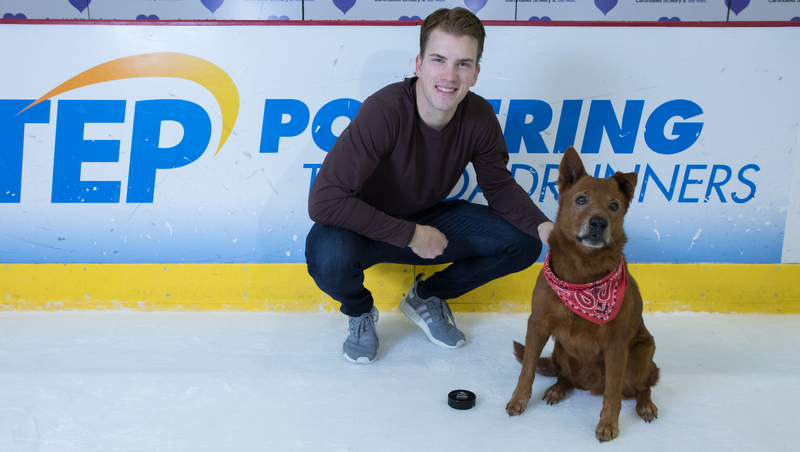 TUCSON, AZ – The Tucson Roadrunners, proud American Hockey League affiliate of the Arizona Coyotes, have teamed up with Pima Animal Care Center and Tucson Electric Power to produce a 2018 calendar featuring adorable, adoptable pets posing with kindhearted hockey players. The ”Roadrunners & Rescues 2018” calendars will go on sale Friday, November 24 at the game against the Stockton Heat for a special price of $10. After Black Friday, the cost for each calendar will be $20. Purchase yours at the Roadrunners’ box office or at Roadrunners home games while supplies last. TEP will design and produce the “Roadrunners & Rescues 2018” calendars and donate all sales proceeds to PACC’s medical fund. For every $30 donation, PACC can provide medical treatment to a pet with kennel cough, a common upper-respiratory infection. Donation to PACC have a direct impact on the health and happiness of pets, and helps to improve their chances of adoption. TEP officials hope to sell all the calendars by early December to present the final proceeds to PACC at the December 5 Roadrunners game. PACC will bring adoptable animals to the above-mentioned games. In addition to the “Roadrunners & Rescues 2018” calendar, the Roadrunners and TEP employees will donate their time to support PACC at its third annual “Gift of Love” Santa Adoption Party happening from 10 a.m. to 5 p.m., December 9-10. During the “Gifts of Love” celebration, PACC will reduce adoption fees. Additionally, adopters will receive a gift for their new pet and a family portrait the includes the newest member of their family. Thanks to the community’s support, more than 200 pets found homes for the holidays last year. Tickets for all 27 remaining Roadrunners home games, including next Wednesday, Friday and Saturday at Tucson Arena, are on sale now and can be purchased by clicking HERE or visiting the Tucson Convention Center box office. For more information on the Roadrunners, call the office at 866-774-6253.